Thanks to technology, Galileo is safe from my raging anger. Google Slides resists the effects of the round world and lets one carry presentations anywhere and share it with anyone, anywhere. A part of the Google Office suite of products, Google Slides is a watered down version of Microsoft Powerpoint. Watered down is not good enough. Oh yeah? Wouldn’t it be good enough if I were to say this is Android we are speaking of. 1. One page or thousand pages, as long as you have sufficient space on your drive you can carry a world of presentations with you. We’ve all been stuck at one time or another by this reality. Google Slides fixes this. With a decent internet connection you can directly access your deck. Meaning, now you wouldn’t have to export PDF files for each of your slides. Store it in PPTX format, download it in the same format even when you are OFFLINE! It also supports formats like .SVG (Scalable Vector Graphics). The .SVG format would let one see their presentation within a browser with or without an internet connection. But without an internet connection would I be able to see the animation, font and the like? Yes, yes and did I say, yes? I should as the answer YES! 2. Gotta love the Research feature under Tool! What do you heavily rely on while working on a presentation? Google, of course! Slides lets you access the search engine directly from within it. No minimizing one and maximizing the other as Slides has it all covered. Google Scholar, New, Images, Videos filters within the Slides app. 3.The video says the rest the best way- create individually or in a group, anywhere, anytime and access the presentation from any device of choice. 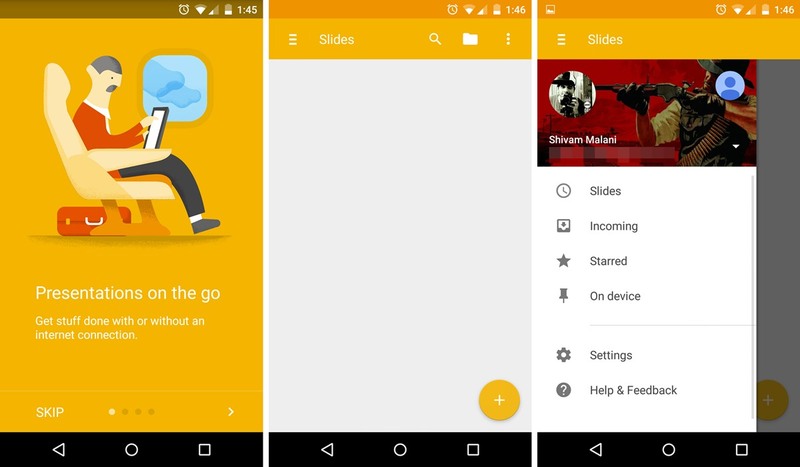 Slides for Android | Ah, well for iOS!